The financial industry has witnessed several challenges over the past couple of years – many of which revolve around rapid digital disruption, continued regulatory changes, and rising bars of customer expectations. In such a scenario when this sector is exploring innovative ways to improve customer service and keep up with constantly changing technology, AI-powered chatbots have emerged as one of the most promising conversational interfaces to bring greater value to the customer experience. Chatbots have empowered the banks, insurance companies, and other financial institutions by simplifying the complex processes, bridging the communication gap between the financial institutions and customers, providing proactive and intelligent recommendations, and digitizing the ways of customer retention, engagement, and acquisition. According to Gartner, more than 50% of enterprises will invest more in chatbot creation than traditional mobile application development, by 2021. By 2022, chatbots will automate 90% of interactions in banks. By 2020, 85% of consumers will interact with their bank using chatbots. 57% of consumers prefer to interact via chatbots for instant support. How chatbots streamline the operations of banking, financial services and insurance (BFSI) industry? One of the biggest challenges for financial institutions is limited support services after office hours. However, IVR (Interactive Voice Response) support is available 24/7 but it can’t answer specific questions related to product fees, features, etc. Implementing a chatbot help overcome these limitations. Chatbots replicate the human interaction and can respond to more service requests and frequently asked questions than an IVR. The Natural Language Processing capability of chatbots let them interpret the specific customer types and respond accordingly. Moreover, chatbots allow customers to tweak their queries with better keywords. Nowadays, customers expect accurate answers to their queries within a few clicks. Chatbots help meet customers’ expectations by analyzing their needs and providing them with the most relevant information. 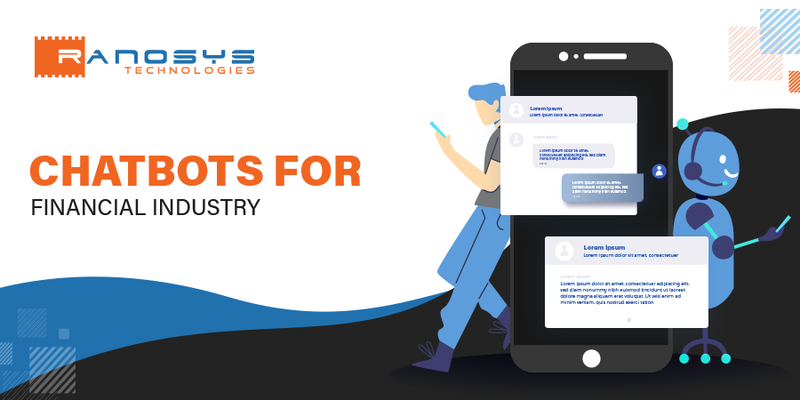 Chatbots are also capable of sending the relevant push notifications in a proactive manner and save money on mass marketing. Furthermore, on the basis of the customer’s response, organizations can adjust the chatbot to improve the information relevancy. Service agents can serve only one customer at a time. Customers need to wait for a few minutes to reach the service agent, particularly during peak hours. Chatbots eliminate the waiting time by serving multiple customers simultaneously. Chatbots have scalable architecture and can be scale up during peak hours. Chatbots are not intended to replace call centers, but to provide consistent and reliable customer service and handle repetitive and simple tasks so that call-center resources can devote their time to handle other priority cases. Chatbots can collect and store customer data automatically. This feature helps financial institutions to understand the areas of dissatisfaction and pain points of customers and enrich and adjust the chatbot database accordingly. In addition, chatbots can self-improve the algorithm on the basis of customers’ feedback, to provide precise answers in the future. Chatbots can set and manage budgets, provide credit scores, and track spending habits of customers. These virtual assistants analyze the financial data of customers and provide smart insights and personalized advice on various investment options available to them. Moreover, users can manage multiple accounts, check their expenses and bank balance via chatbots. Chatbots, if well implemented, can help prevent fraudulent activities. They have features of capturing transaction data and fetching analytics. Moreover, chatbots send automatic transaction notification in real-time to keep users updated with their account activities. With their endless possibilities, chatbots are the next big thing for the financial industry. If implemented precisely, chatbots can resolve queries of several customers instantly and increase their engagement. Any flaw in the deployment of these virtual assistants can backfire. Therefore, partner with an experienced chatbot development company to get first-mover advantage.